I've just completed a new archive page for the Pete Atkin Newsletter. This one is not only prettier than its predecessor, it's also less cumbersome, easier to navigate, and it's available for public viewing, where the old one was restricted to MV members. In order to make the archive browsable without needing a log-in, I've gone through the messages and redacted such e-mail addresses, street addresses and phone numbers as may infringe the privacy of subscribers. That is to say, I've assumed that every message was created (by Pete) expressly for viewing by an exclusive readership, comprised of (1) direct subscribers to the Newsletter, and (2) members of Midnight Voices, who also appreciate the need for confidentiality (note the comma). That's not to say we have anything to be ashamed of ("I was a secret Pete Atkin fan"), but none of us wants his or her e-mail address, let alone our phone number or home address, harvested from the Website and used for all manner of horrid spammy purposes. 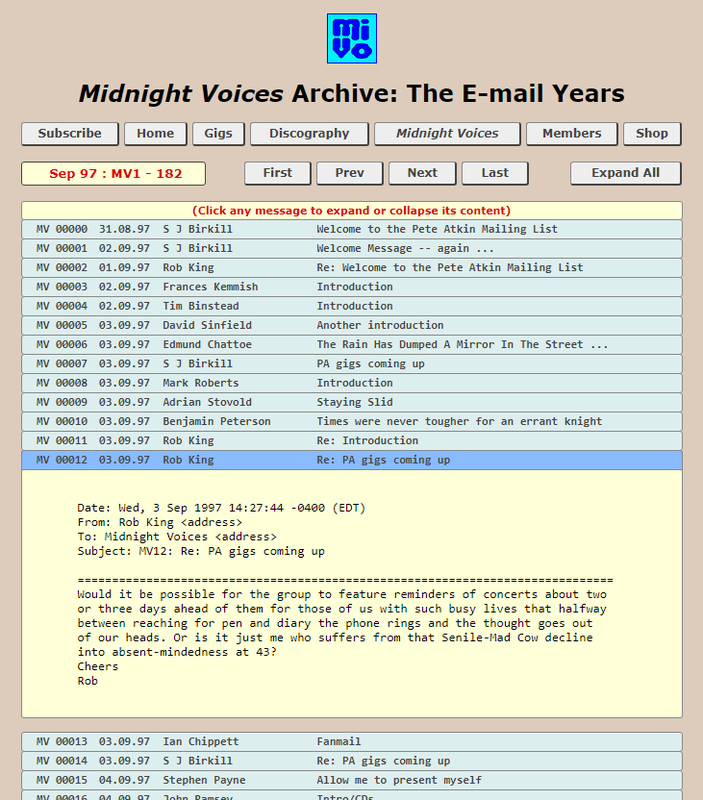 On the same principle, I'm hoping to find time to perform the equivalent process on the 10,945 posts made to the original e-mail-based MV, so that the remarkably erudite output of our group over its first seven years can be seen by all. To do this, I'll need to redact all identifying detail, leaving just the author's name as attribution for each message. I'll use the same accordion-style presentation as I've developed for the Newsletter archive. What do you think? The old Newsletter archive in the MV Members' Area is now discontinued. That looks like a great system Steve. Thanks as always for your hard work with it. For some reason the "collapse all" doesn't work after you've collapsed the first couple of messages unless you then expand all again ... or is that just on my computer? Thank you for your note of appreciation -- most welcome. Sometimes I think I'm doing all this stuff just for my own satisfaction, there's so little response. I do fear more and more of our regulars have drifted out of the habit of checking MV, or even the Website, on any kind of regular basis, waiting for Pete's newsletter (or even F*c*book) to alert them to anything of interest. Even Pete is seldom on here now. I was seriously contemplating mothballing the whole enterprise after the faint praise Pete gave MV in his last-but-one newsletter. I've no desire to be the only one posting here! I've started to format the old e-mail MV posts for the same style of presentation, and I'm reminded just how rich, clever and funny the discussions were back in 1997. It's just got to be done -- I view them as a precious resource -- but it's gonna be pretty labour-intensive: there were 182 messages in September 1997 alone, and each has to have its serial number, date, author and title extracted for the headers, all e-mail addresses, street addresses and phone numbers redacted so I can safely post them in the public part of the Website without betraying e-mail group confidentiality, and the headers and word wrap tweaked for conformity. With 10945 to process, it'll take a while. I may launch it with only year 1997 (Sep-Dec) done, and add the rest month by month. Even at 72, I got better things to do! It's not the only thing that wasn't reaching its audience any more while being hidden behind the need for MV log-in. Even after the recent amnesty, I think few were able to appreciate the private albums, JC content and the rest that was available to members via audio streaming. Not a single new member joined up, so clearly I'm wasting my precious time. Everyone's joined FB and gone short-attention-spanning! Even Clive has been saying that YouTube is the best way to listen to his and Pete's songs! Please don't stop! Some of us refuse to F*c*book, so the site is the only place to get this info. I am still using the RSS feed, so that I get prompted with new messages. As for the audio streaming, it was very useful a couple of weeks ago. I was running the sound desk for a Rhythm and Blues band at the Edinburgh Fringe (go, Ken Wood and the Mixers! ), and the drummer mentioned a lack of songs about drummers. A few seconds to get to the website, and there was "Wristwatch" in all of its audio glory. Now I'm off to take out some of the informative pop-ups, menu tooltips, message previews and additional information widgets on the MV index pages -- no-one needs IP look-ups, and they seem to slow the page loading unduly (Dreamhost provides exceptional flexibility and value for money, but they're hardly the fastest), and, like alligator sandwiches, we need to be snappy!